Why Do We Display Premiums? Are Premiums Displayed on Non-Gold Items? We like to make buying gold as easy as 1, 2, 3. You will see that we are transparent with our premiums and display them on all our investment gold products. If you are looking for 1 ounce silver coins, please click here. We usually think of a premium as a percentage over the intrinsic value, as this makes comparison easier between different products, weights, metals and times. In other words, a premium is the price you pay over the gold content of the bar or coin. A clever investor will buy the product with the lowest premium over gold. You will see on our pages a column for the premium and the final price for that item (inclusive of the premium). There is a choice of gold bullion coins for investors, but our advice is generally to buy the cheapest, determined by percentage premium over intrinsic value. 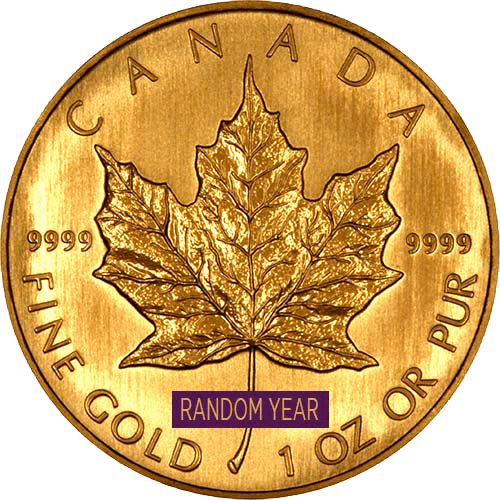 The following one ounce bullion coins are the most readily available, although there are others. Other gold coins containing one ounce of fine gold do exist, but they are not as widely available, so we can ignore them here. Over many years, our advice to investors has been very simple and consistent. Within reason, buy the cheapest. 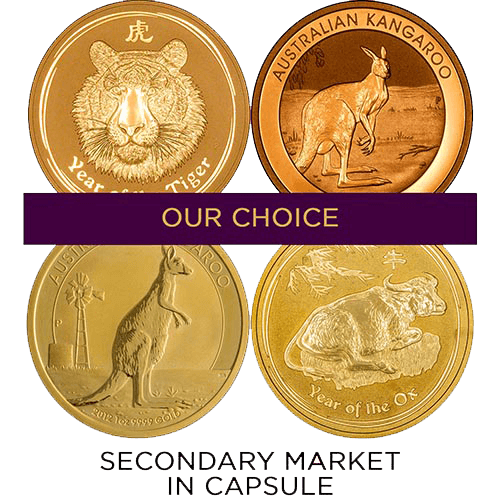 If you want the best possible price on one-ounce gold bullion coins, leave the choice to us with our newly minted one ounce coins or secondary market gold coins. Most of the time you will receive Krugerrands, but occasionally you may be lucky enough to get nuggets, maples, Britannias, eagles, or any of the other one ounce coins. These are normally more expensive, but occasionally we have a surplus of one of them, and a shortage of Krugerrands. Whatever happens, you win as you get a better price, and possibly a "better" coin. Simply, so that you can compare prices between products and other suppliers, so YOU get the best deal and therefore the best products to add to your investment portfolio. As all of our prices are based on the live price of gold, it can often be a difficult task to compare like for like in order to find the best buy, as the price fluctuates. This also applies when you compare our prices against other bullion dealers. For example, you may see that we are offering a Krugerrand for £800 but when you check later another dealer may be offering to sell the same coin at £795. The logical thing to do would be to buy from the company offering the lowest price. However is the lower priced coin a better price because of a lower premium or because of a lower gold price. Therefore, we would always recommend you compare premiums and not prices! Displaying premiums on non-gold items is a bit more tricky. There are added costs such as VAT and manufacturing or distributer costs to consider. Although most of these products will be based on a percentage premium, they may or may not have surcharges too; a monetary amount added on top of a premium. We get this question a lot. We have to clarify the question; the cheapest item to buy or the lowest premium item? The "cheapest" (or lowest price) item would probably be a 1 gram gold bar. 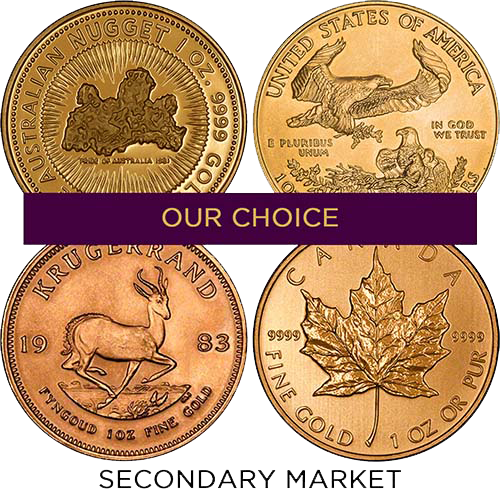 But the CHEAPEST (lowest premium / best value) would be Our Choice Secondary Market Gold Coin. Why? The 1gram bar has a premium of 25% whereas the gold coin has a premium of 2.5%. Buying the lower premium would mean a better return on your investment. We would always advise to go for the lowest premium product for your budget. We have done the hard work for you, so you can view all the information in one place to make a better, more informed decision. Don't forget to always look for our special offers page! - Subscribe to our mailing list for secret special offers, latest coin news and new releases. 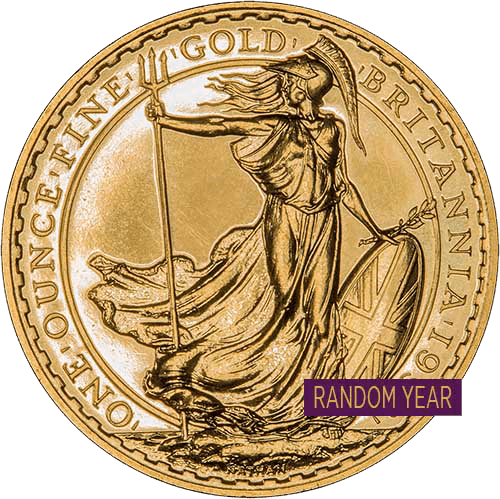 Most of the time, Krugerrands are more readily available than any other one ounce bullion coins, and at lower prices. Krugerrands are therefore a better investment purchase than the other alternatives. 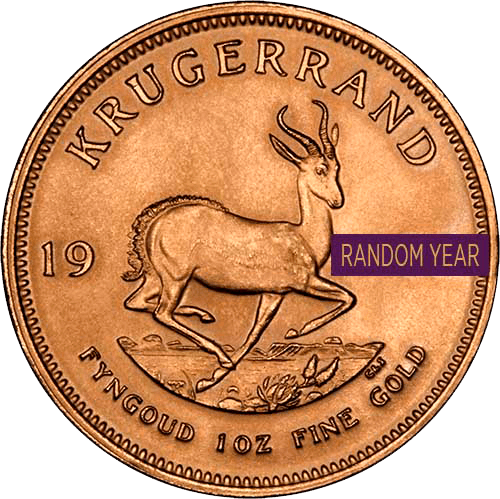 Since we created this page in 1999 / 2000, at times the premium on Krugerrands has been ridiculously high, due to lemmings, when we would strongly recommend buying whatever else happens to be the cheapest at the time. We have also introduced "our choice"
It is often possible to buy older "real" gold coins for a similar premium to Krugerrands, in which case, we would normally recommend buying them instead. 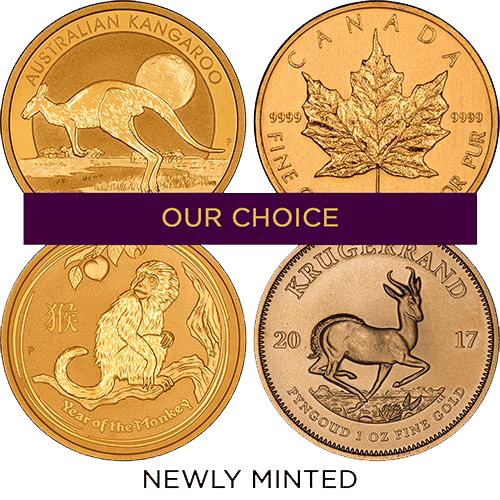 More information on our Real Coins versus Bullion Coins page. Since we wrote this last paragraph, supply of most of these older coins has also tightened and premiums firmed up, demonstrating that our advice was right. As we cannot update this and all the 10,000 other pages of our websites every few day, please remember to think flexibly.